If you thought one Oor Wullie was a mischief, look out because here are two! Shopping centre boss Peter Beagley dressed up as Scotland’s favourite scamp for the day as he launched intu Braehead’s bid to raise money for Glasgow Children’s Hospital Charity. A life-size statue of The Sunday Post’s comic strip character is coming to the Renfrewshire mall as part of Oor Wullie’s BIG Bucket Trail 2019. It’ll be on display in June in the lower mall, with shoppers able to download an app on their mobile phone or tablet, which will register they have visited the statue. They can then claim a reward from the centre’s customer services desk. The intu Braehead sculpture will have its own unique design pattern when it is unveiled, and is one of 200 Oor Wullie statues popping up around Scotland. Yesterday, Glasgow Caledonian University revealed they’d also be home to one of the statues when the trail gets underway. It follows the success of the Bucket Trail in Dundee in 2016. As part of the sponsorship, intu Braehead will also receive a smaller statue that they are gifting to the Riverbrae School, in Linwood for the pupils there to decorate with their own designs. This will also go on display in the shopping centre before going back to the school. Peter, regional centre director with responsibility for intu Braehead said: “You could say one of the things on my bucket list is to raise funds for Glasgow Children’s Hospital Charity. And all our staff and shoppers can have a bit of fun along the way. Glasgow Children’s Hospital Charity supports babies, children and young people being treated at the city’s Royal Hospital for Children. Other charities benefiting from Oor Wullie’s BIG Bucket Trail elsewhere in Scotland are Edinburgh Children’s Hospital Charity and the ARCHIE Foundation. 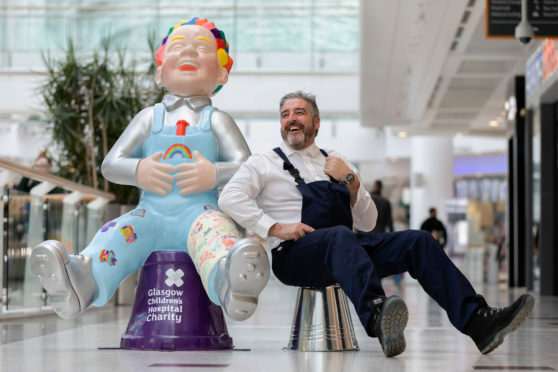 Kirsten Sinclair, Chief Operating Officer, Glasgow Children’s Hospital Charity said: “It’s fantastic to see that Peter and the team at intu Braehead have already embraced the fun and creativity that Oor Wullie’s BIG Bucket Trail will bring to Scotland this summer. After being on display in the summer, the statues will be auctioned off for charity in September. Exact details of the final designs are being kept under wraps, with the final patterns being released in full later this year. Designs were submitted from across the country from people of all ages. As if Wullie wasn’t busy enough with his bucket trail, a new musical based on the character was announced in The Sunday Post at the weekend. Read more here.